Leonardo DiCaprio was seen having lunch at Cecconi’s at Soho Beach House on Saturday afternoon. After entering the Sony Open as a wild card in the women’s singles tournament, Miami resident and Tennis Pro Nadia Petrova bowed out in the early stages of Sony Open Tennis and used the remaining tournament time to catch up on some brow maintenance of her own at Rik Rak Salon. Petrova, the former world number three, beat Urszula Radwanska in the qualifiers and battled on to a second-round clash and lost to Sabine Lisicki. In South Florida filming the third season of Emeril’s Florida, celebrity chef Emeril Lagasse visited some of the area’s hottest restaurants. His stops included Meat Market on Lincoln Road where Emeril sat with Executive Chef Sean Brasel on Wednesday. The crew traveled up to Fort Lauderdale on Thursday and wrapped the season’s filming at Casa D’Angelo with culinary maestro Angelo Elia. After filming, Emeril and his team enjoyed their wrap dinner in the private wine dining room, where Chef Elia served up an abundance of authentic Tuscan dishes and wines from the award-winning 18,000 bottle wine collection. Among the line-up at the SiriusXM lounge during Miami Music Week this year: Armin van Buuren, Tiesto, Paul Oakenfold, Steve Aoki, Hardwell, Martin Garrix and Dyro. The DJs spun in an intimate poolside setting for this three-day lounge that also had celebs in attendance such as Brian Grazer, Sky Blu from LMFAO, Nina Agdal, Reggie Bush and Mike Mackenzie, who sipped on cocktails provided by Smirnoff, Heineken and Vita Coco and received gifts by 808 Audio, House of Horology Watches and RAZON Sunglasses. John Leguizamo was recently spotted at SUGARCANE raw bar grill dining with a party of eight. 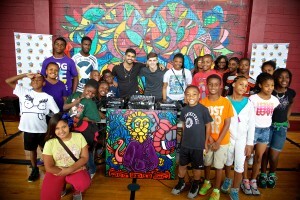 Art, music and memories were made during a special visit to Alonso Mourning’s Overtown Youth Center by EDM star Martin Garrix and artist Alexander Mijares. The afternoon of DJing and painting with the pros brought Miami Music Week to the Center’s students by teaching them the basics of music mixing and painting, and how music and art can work together in tandem. Garrix and Mijares danced with the students to Garrix’s worldwide hit “Animals” and then made the surprise announcement that each student would leave with Limited Edition Beats by Dre headphones. In addition, Mijares created an original piece for the event titled “Animals” after Garrix’s biggest hit with proceeds going to the Overtown Youth Center. Karla McKinley celebrated her birthday at Zuma with daughter, jewelry designer Madison McKinley, who is presently at Parson’s in New York City, tennis star John Isner and other friends. Karla flew in from Dallas for the Sony Open and some Miami sunshine.